My work is so much of who I am. So much of who YOU are, too, I know. You are dedicated, committed and absolutely on fire to do meaningful work in the world. And you do -- in big and small ways, just by being you, you are changing the ecosystem of the world through your love, through your wisdom, through your magic. As joyful and fulfilling as work is, you need more. You need time for deep sustenance. Time to rest. Time to think. Time for pleasure and play. Time to indulge your longings. I have learned, over lots of time, and many fumbles, that I am at my best when I weave deep and meaningful nourishment into my days. And I also need time to step away completely -- to honor my longings as fully as I can. I believe we all need that kind of spaciousness and I wonder... how many of us actually give ourselves that time? What I notice when I do give myself that time is that I return to work anew. I return to my pursuits with loads of energy and fresh ideas. As much as our culture pushes endless productivity, we simply don't work like that, do we? So, as I head out on a month long vacation home to the U.S., I fully intend to honor my longings. 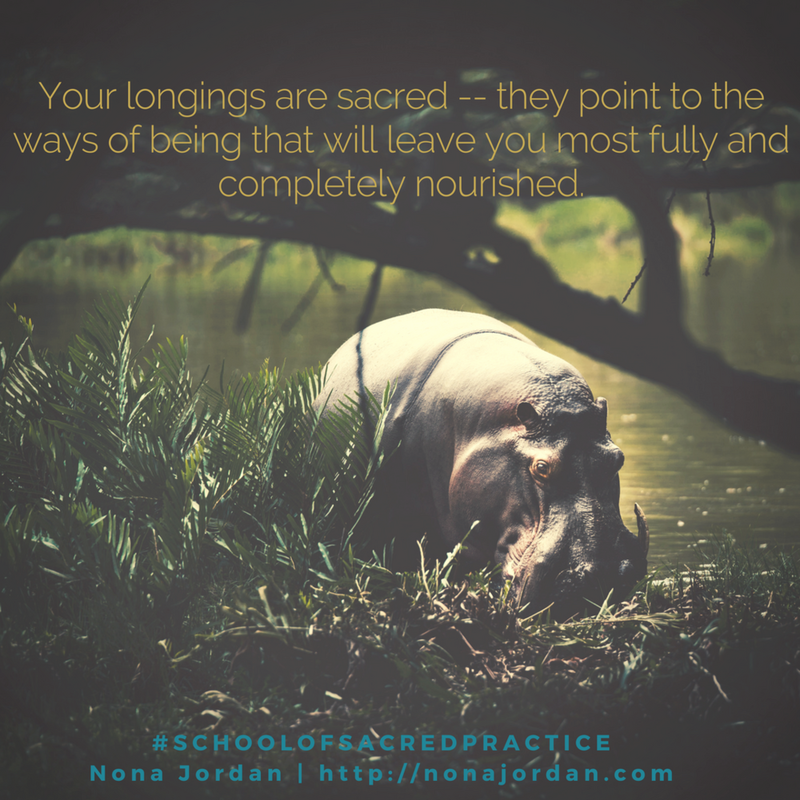 The longings I have (that you have) point to the ways that we are most deeply refilled, most fully nourished. The things that create the richest, lushest topsoil from which to create. The other day, I was writing with the prompt, "I long to be." and it made me think of you, and me, and meaningful work and how extremely important it is to honor the longings. As the northern hemisphere bakes in the heat of long days and short, summer nights and the southern hemisphere enjoys it's lovely and mild version of winter, may you know, and honor, your longings -- -- for me, it's undoubtedly the time I spend with earth, in wild spaces, as you'll see from my writing below. to be bitten and scratched, hot and burnt, ravished in the space between earth and sun. to be cleansed, letting the heat of my skin be swept away by the current. and kissed by moonlight as I dream. to be woken by lions on the prowl, holding my breath when the king's great mane brushes against my back as I hang in the balance. to hover -- like magic, really -- so gracefully before plunging into the water. fierce and mysterious in being made for both land and river. pregnant, holding the future of my kind in my belly. Even the warthog, who kneels in prayer and looks like she is kissing the earth when she eats. I long to live in a treehouse. Hobbit-style or Robinson Carusoe -- it doesn't matter as long as the tree says yes and we can tell each other our secrets. to make a deeper and wider contribution. A legacy. And then the pied crow catches my eye and I just want to go back home. to go deep into the forest, to the ocean, to the wild places. I am simply one of many beings who share the ancient exhalation of our star, the sun. but let it be in a world that values life, and I don't mean just lip-service. Maybe long ago or in a (not so) distant future when all beings, all life, will flourish and be celebrated for it. to be rich topsoil that nourishes beauty and bellies alike, that connects the trees and cushions the fall of children who lose their footing. To lean into life and to appreciate every inch, every mile traversed. To love it with all of my soul yesterday, today and tomorrow. May you honor the longing of your soul. May this coming season offer you ample opportunities to hear, and follow, the longings. To feel deeply nourished. To fill your cup with pleasure so you can come back to what is important and meaningful in your work with fresh eyes and ample energy. I wake up with questions. Questions I know will become prayers that pave the path of my journey. The quality of the questions, I know now, determines so much of the experience. I've struggled with new beginnings. Do I need to recite every catalyst, big and small, like it's own form of prayer, rubbing the mala beads smooth as I mutter under my breath? Is it necessary to mark the countless ways life has held out her hand and asked me to dance and I've either abandoned myself to the dance floor or (most often) I've pulled back, clinging to the wall -- desperately wishing for a song I know by heart. Change is the most constant companion I've known, outside of the skin I live in. I haven't been a gracious companion to change, as I mentioned. I've wanted solid ground, asked for life to stay fixed in one spot -- you know the one. That one day where your jeans fit perfectly, everyone you care about loves you, your business is prosperous and meaningful, your energy is up, the weather is just the way you like it, your children are at 'that magical age' and you and your beloved are at your unmessy best with each other. And, of course, your hair is perfect. Hold it. That's it. Just the way I want it. I have such compassion for this desire to arrange life just so. It reminds me of the way my daughter and her friends used to set up the Playmobil sets and beg and plead, "Please can we leave it set up? It's perfect just the way it is!" Inevitably a little brother or an animal or parental impatience with small plastic figurines would intervene and the perfectly arranged scene would go back in the box, in a jumble, while my daughter would wail in protest. This urge is adorable and confounding. "Honey, you can set it up again.... why don't you PLAY with it?" and her perfect response, "It won't be the same, " and, "I don't want to mess it up!" I would cluck and nod (I know it's hard honey) and then assure her it would be just as good next time as I scooped her up and kissed her tear-stained cheeks. I was staring in a small, curly-haired, olive-complected mirror and I barely saw the reflection in that moment, but hindsight is so clear, isn't it? Moving my fingers over the beads, I've completed my prayers honoring the past. Heart open, the hand of change catches mine, again and again as I look to the future. Birth of babies, birth of plants, animals, birth of new projects, ideas, lives, communities, eco-systems and nations. From the personal to the collective, beginnings have their roots in darkness. I am in awe of how a seed, frozen into the cold winter earth, surrounded by dark soil, follows instinct and (as a human I imagine) faith, to sprout and shoot in the right direction -- toward the sun, toward warmth, toward life above ground. Toward fruition. We, as humans, we have that same instinct to move in the right direction, toward the growth that is ours to live into -- whether we choose the circumstance or whether it's chosen us. The more deliberately we honor this instinct, the more enlivened and joyful life can be, no matter what change offers us. I'm in the thick of darkness right now, the first light of the sun at the horizon -- that liminal space where change and growth and new life is stirring - within me, in our life and in the world. It feels delicious. Anticipatory, despite the challenges that we will most certainly face. Today, like the seed, I say yes because I embrace change and my instinct is to grow. I ask to listen. May my questions lead me toward living fully. I ask for presence. May I live with my heart and mind wide open. I ask for adventure. May I be changed by my experience and be a force for good. I ask to be a blessing. May I offer grace to those I meet along the way. I ask for authenticity. May I listen to my own heart and speak wisely. I ask to connect. May I attune to the heartbeat of Zambia and her people. I ask for courage. May I walk in beauty and truth and wonder. I ask to feel roots. May I feel the first threads of belonging and honor them accordingly. These are my questions, my prayers, spoken into the future on behalf of what has begun. Your questions, too, become the prayers that pave the path of your journey. The quality of the questions will shape and mold so much of the experience. What will your prayer for new beginnings be?